Language skills, study skills, argument skills and legal knowledge are vital to every law student, professional lawyer and academic. 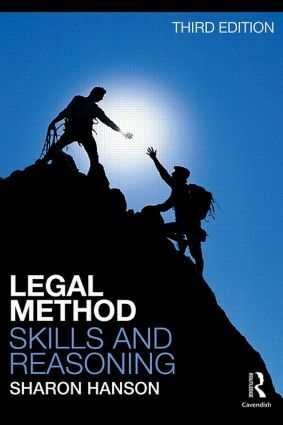 Legal Method, Skills and Reasoning suggests a range of 'how-to' techniques for perfecting these academic and practical skills. It explains how to work with legal texts; how to read and write about the law; how to acquire effective disciplined study techniques; and how to construct legal arguments. Packed full of practical examples and diagrams across the range of legal skills from language and research skills to mooting and negotiation, this edition will be invaluable to law students seeking to acquire a deeper understanding of how to apply each discreet legal skill effectively. This restructured third edition is now additionally supported by a Companion Website offering a wealth of additional resources for individual and group work for both students and lecturers. self-test quizzes to consolidate learning for each individual legal skill. sample legal skills assessment, and accompanying answers.